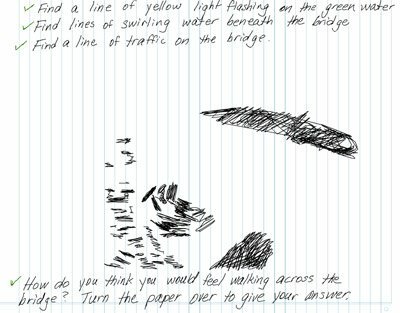 These smartpen art activities will have you thinking (and drawing) outside of the box in your art education program. Use audio dots or sound stickers to create an interactive talking art book. The book pictured below asked young students to identify different items within the picture. 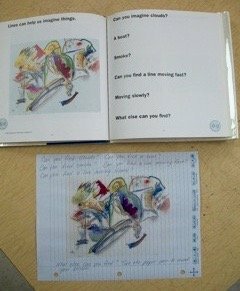 In addition to recording the book being read aloud on a sound sticker, create an activity sheet using the "hotspot technique" that the student is able to interact with. The activity page pictured in the photo on the right below is the pencast result of the interactive activity page you see in the picture on the left. Notice the "hotspots," the scribbled areas on the pencast PDF, where feedback can be recorded that will play when students click on the hotspot. 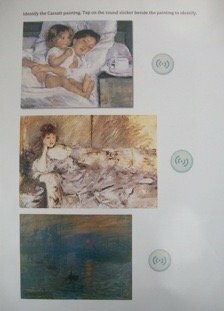 Create review sheets with a mix of Impressionist paintings on them, with a sound sticker beside each painting. Post a question about the paintings at the top of the page, such as "Which painting is the Degas painting? Students tap the sound sticker beside the painting that is by Degas. If they choose the correct painting, the sound sticker says "Correct, this is a painting by Degas! Notice it has that snapshot quality to it," (or whatever information you as the teacher want to pass on about identifying features of this artist's work). 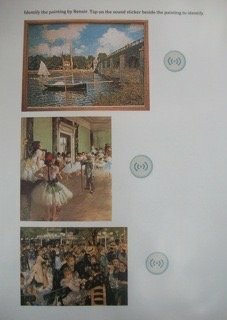 If they tap the sound sticker by an incorrect painting, the recording says, "Sorry, this is painting by Renoir and the teacher can provide some hints to identifying the work of Renoir. Create a review sheet for each artist - i.e. Renoir, Cassatt, Monet, Morisot. As a classroom station while studying various artists, leave a Livescribe sticky note and smartpen for students to record a list of interview questions they might ask the artist if the artist was alive today. 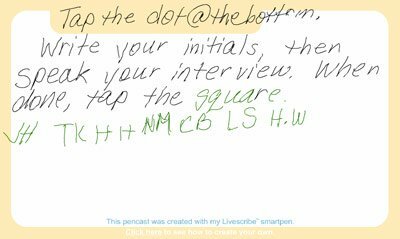 To record the interview, students simply tap Record, write their initials, speak the interview questions into the pen, and then tap Stop. If students need time to think after they have already started the recording, encourage them to tap Pause. This will allow them time to think but will keep the data in one audio session. As an extension to this activity, one student could ask interview questions of one student who pretends to be the artist, answering the interview questions as the famous artist might have. Allow students to do preliminary art sketches on Livescribe paper. Students are then able to add thoughts, indicate colors, and add a variety of things to the sketch in the form of a pencast. The pencast can be emailed to the teacher, so that students can get immediate feedback before putting it to canvas. Students can add voice to caricatures. Livescribe smartpens make creating "How to Draw videos" a breeze because it is so easy to see what you are drawing as you are speaking. We want your ideas for more smartpen art activities! Share your idea and we'll pass it along for others to benefit from.